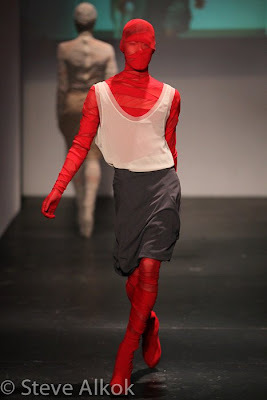 For the lack of a better term, I would like to call this my list of great unconventional creations displayed at |FAT|. 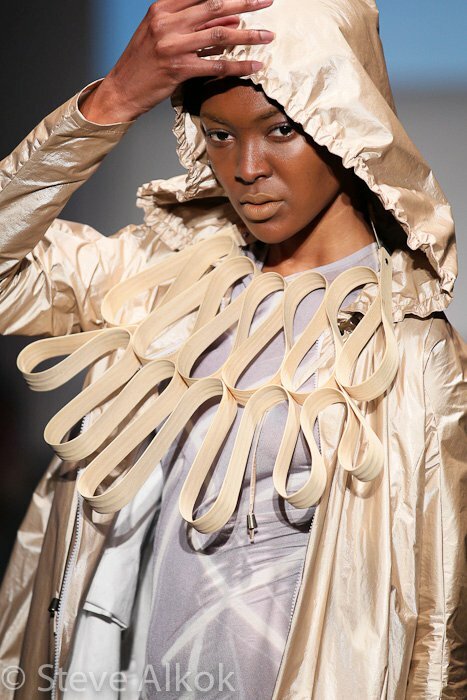 One prominent aspect of the show was to showcase fashion as an art form, and while I don't deny that all fashion is art, these artistic fashions especially caught my attention for being especially art-centered. These fashions are typically focused on creativity and experimentation rather than wearability. This collection mesmerized me not only because of the fashion, but because of the narrative performance aspect. With a mystical winter animal essence, models engaged in a muted conversation of seduction. Women wore beautiful white form-fitting dresses with black lace and floral detailing. The floor-sweeping gowns brought on an enchanting goddess appeal. Holding a similar enchantment was the men with pants that laced up along the sides and harnesses with animal-like features. In contrast to the women, the men wore black. 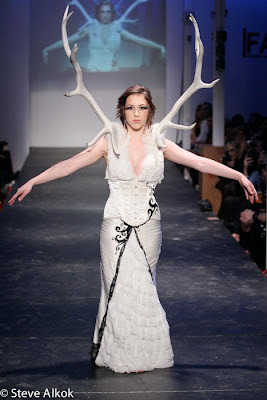 While I categorized this as an "unconventional creation" because of some of the horned pieces, the dresses would definitely be suiting for any formal event. I would have appreciated the designs of this collection anyway, but the fact that it was completely made of paper makes it even more amazing. The dresses were incredibly structured in a variety of fashions with A-lines, bubble skirts, strapless bodices, and layered skirts. 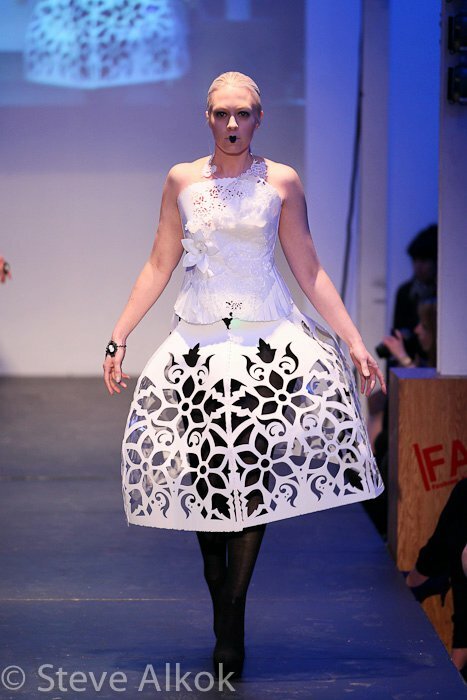 The dresses featured doily-like stencil cutouts and floral decorations. A special addition was the use of LED lights that literally made the dresses shine. This is truly an arts & crafts project taken to the extreme...I mean, I can barely make a paper snowflake. 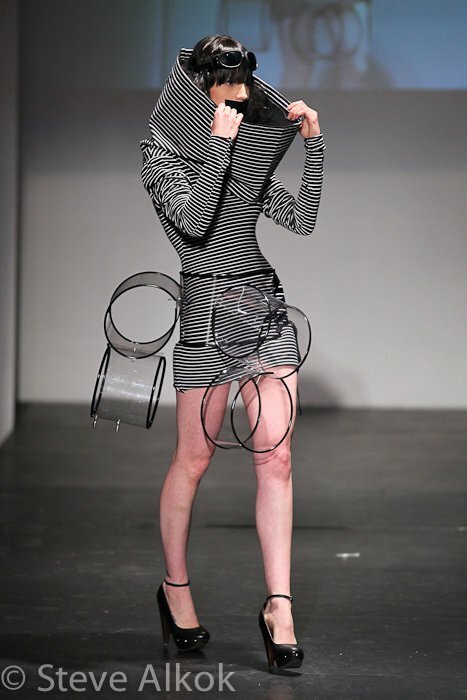 Ackerman was one of the most anticipated designers of the show. 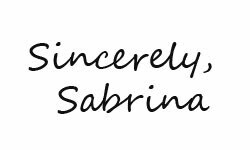 She definitely did not disappoint. 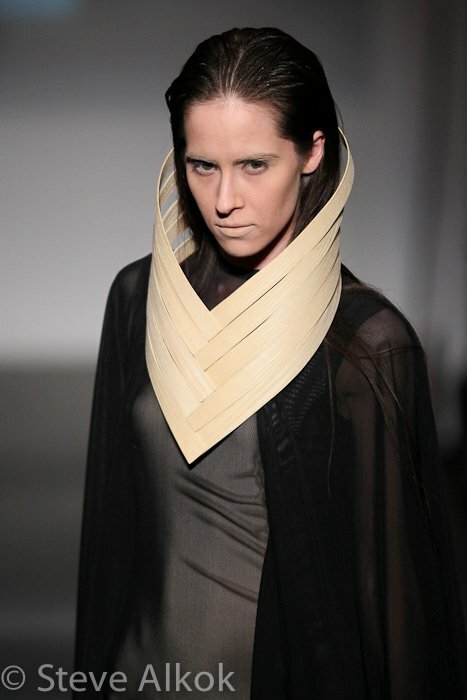 Her experimental collaboration with industrial designer Lindsay Sinclair brought intriguing wooden structures word by the models. These structures were V-shaped, curvy, and rigid. This impressive display fit along the head, ankles, wrists, neck, and back. 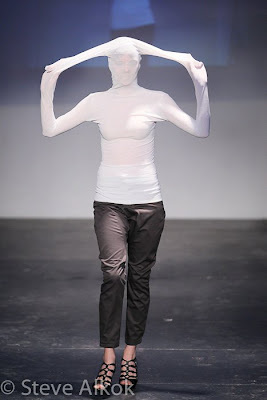 Some of these structures appeared to be extensions of the skin with ornaments that fit around the contour of the body. Hello, shock value! 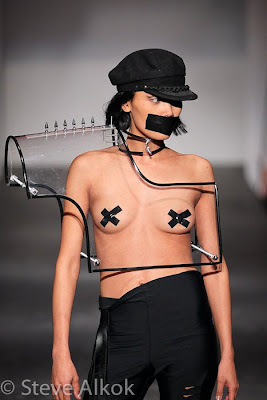 While models with tape over their breasts and mouths were one thing, I tried not to be overly distracted by that. I'd like to bring your attention to the designs. This punky collection included a choker with long tassels and a waistband with transparent, hollow rectangles. 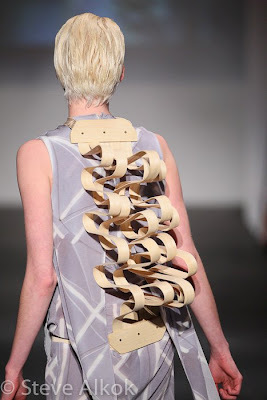 One distinct feature was the use of case-like objects shaped like a shirt. I think it's quite clever to have a chunky object worn as an outline of a top. 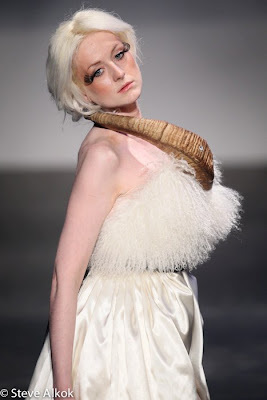 NRT fashions definitely did edgy well. "The Asylum" featured a line of extremely long sleeves fashioned in straitjacket-like restriction. Sleeves were connected to other articles of clothing such as pants and coverings over the head. 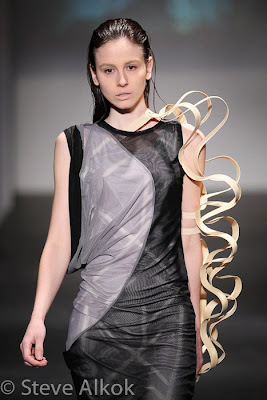 Models were also connected to each other by the sleeves. 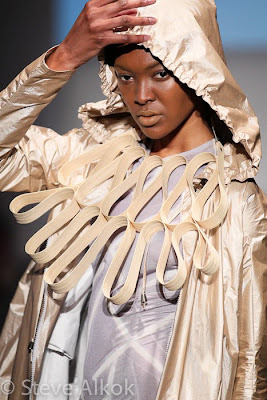 Buckles and wraps were also a prominent feature to add to the restrictive effect. The designs themselves are admittedly quite simple, but it's the concept behind them that interests me. 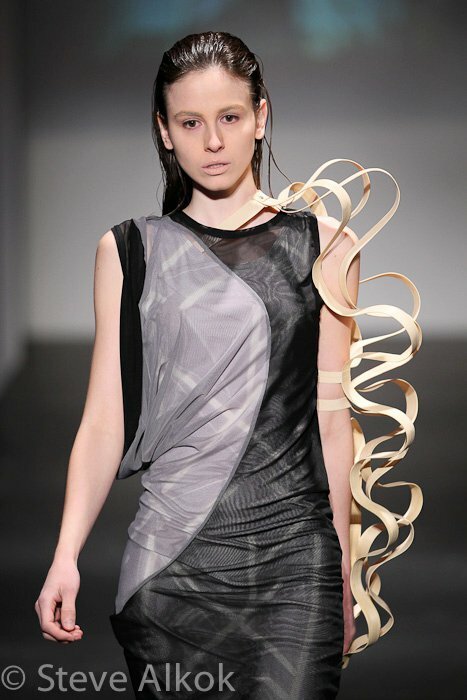 While Anastasia Lomonova and House of Etiquette had interesting concepts, their designs didn't wow me like the others. Anastasia Lomonova's models showed no skin as they were completely covered from head to toe in bandage-like cloth. In fact, the cloth even covered over their chunky wedges, which was a neat effect. House of Etiquette models looked like they had their outfits painted on with the collection made entirely of latex.